Wild Heliotrope is a member of the Waterleaf Family. The plant grows to 30 inches in height and has green, finely haired variable leaves that grow to 3 inches in length. 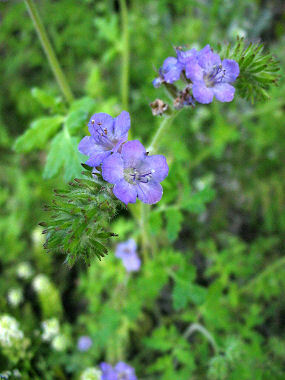 The plant typically grows along washes and on slopes at elevations between 1000 - 4000 feet. Wild Heliotrope can often be found growing in a tangle among other plants and shrubs. Wild Heliotrope blooms between February - May and produces blue, bell-shaped flowers with 5 rounded, joined petals to 0.25 inches in width.